The Bank of England says confidence among households and businesses is likely to be supported by last week's progress in Brexit talks. Last week the European Union agreed that sufficient progress had been made in Brexit negotiations to allow progress to the next stage and to put in place a transition period from 2019. The Bank said that would reduce the likelihood of a "disorderly" Brexit. 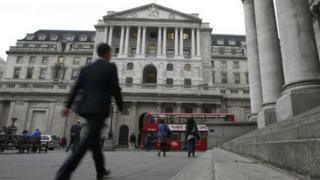 Bank policy makers have also agreed to keep interest rates on hold at 0.5%. In minutes from the latest meeting of the Monetary Policy Committee (MPC), the Bank said that since its previous meeting in early November there had been two "significant events": the Autumn Budget and progress in Brexit talks. Last week's agreement between the UK and the European Union would "reduce the likelihood of a disorderly exit, and was likely to support household and corporate confidence," the MPC said. However, it said the reaction of households, businesses and markets to developments on Brexit talks "remain the most significant influence on, and source of uncertainty about, the economic outlook". Since their last meeting, members of the MPC have also assessed the potential impact of the November's Autumn Budget. They believe it will lift the level of GDP by 0.3% by 2020, as Chancellor Philip Hammond eased up on austerity measures. On Tuesday, the Office for National Statistics (ONS) reported that inflation as measured by the Consumer Prices Index hit 3.1% in November, the highest rate in nearly six years. That rise above 3% means Bank of England governor Mark Carney has to write to the government and explain why inflation is so far above the target of 2%. That letter will be revealed along with the Bank's next Quarterly Inflation report, next February. The MPC today repeated its view that inflation was "likely to be close to its peak". The Bank argues that the main reason behind rising inflation has been the decline in value of the pound, which fell sharply in June 2016 when the UK voted to leave the European Union. Although the pound has recovered in recent months, it is still about 10% lower against the dollar and the euro, which makes imported goods, food and raw materials more expensive. Last month the MPC decided to raise interest rates for the first time in 10 years. It attributed the 0.25% rise to record-low unemployment, rising inflation and stronger global growth. It also indicated there would be two more rises over the next three years. In the minutes from its latest meeting the Bank said "modest" increases in interest rates would be needed over the next few years, but repeated previous promises that those rises would be "gradual and to a limited extent". Higher interest rates have a big impact on the economy. Of the 8.1 million households with a mortgage, 3.7 million - or 46% - are on either a standard variable rate or a tracker rate - which generally move in line with the official bank rate. A move higher can also give savers a lift as High Street banks generally have to raise their rates of interest.